Epic Seas – My Custom Fantasy Set is “Done”! I started making custom game pieces for Pirates CSG back in 2011, but up until 2018 I mostly just made historical customs. Around February 1st of 2018, I started making some “fantasy”, or non-historical, custom game pieces. It only took me about a week to really rev up “production” and I was off to the races creating a TON of fantasy customs. On February 9th I officially announced my second custom set, which would be an all-fantasy set to be the utter opposite of my main custom set, Pirates of the Age of Sail. There is more coming, but I would estimate that I won’t add more than a few dozen more pieces eventually. That could change, but for now the set is mostly done. Boy was I WAY wrong!! Lately I have been finalizing the set in various ways – almost every game piece should now have flavor text. The only exceptions should be some of the stuff that normally didn’t have flavor text – UT’s and equipment. I’ve also been working through some of the unfinished or partly finished customs, to the point where now there shouldn’t be any customs in the set that are “not ready for playtesting”, which I like to denote with a question mark somewhere with the ship stats/abilities. The “Collector’s Numbers” are mostly inaccurate and simply reflect which game pieces have been publicly released on a forum such as the Custom Ships thread that you can post in. Chaos reigns. Strife is rampant. With the global political situation teetering on the edge of absolute catastrophe, conflict seems inevitable. The Cursed have risen again, and appear to be far stronger than ever before. A prolonged worldwide arms race and increasing tensions in every ocean can lead to only one thing: WAR. Gold will be lost, and glory will be found. Which side will you take in Pirates of the Epic Seas? I’ve been wanting to do a “set analysis” for quite some time, and now that I’m pretty satisfied with the set’s progress, hitting 1,000 game pieces is the perfect time to finally look at the numbers. 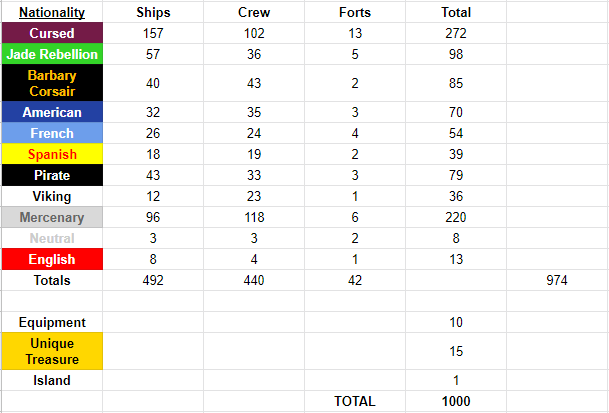 The set was NEVER meant to be balanced, in terms of factional parity or in terms of ship/crew ratios within each faction. That’s part of the reason it’s pretty random. However, I’m actually quite satisfied with how it has turned out. Below you can see part of the new sheet with the breakdown of game pieces. Thanks for checking out my custom set! Posted in Custom and tagged 2019, Epic.